October 2nd, 2015. The Digimon World -next 0rder- title site updated this morning to add Jijimon's profile to its character page, in a separate section now reserved exclusively for the game's Digimon characters. The elder of a certain village. A very serious Digimon with a strong sense of responsibility, but also a little senile. To call back the Digimon that Mugendramon attacked and scattered, he's working on the reconstruction of the town. 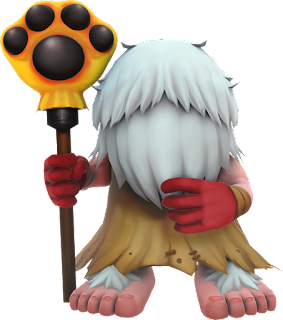 The "certain village" mentioned in his profile likely refers to the Village of Beginnings found in the original Digimon World, which was called File City in the official English-language localizations of the game. Jijimon was previously introduced in last month's issue of V Jump magazine, which also detailed the game's dual partner system, and new character Oofuchi Himari.